Hotel "7 days" is located on the 5th floor of a large modern entertainment center, located in a new residential region of Kiev, Nikolska - Borshahivka. 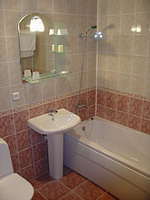 Hotel is located in 30 minutes car ride from the city center, close to “Zhuliany” airport, in about 20 minutes car ride from the train station. telephone, Internet access; suites are supplied with air conditioning /climate control system. 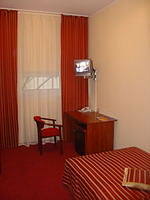 All rooms have modern furniture and private facilities (bathrooms with bathtubs).